The Turkish government's direct-sales drive, known as "tanzim satış," will soon be launched on the country's national online marketplace at www.epttavm.com, Transport and Infrastructure Minister Cahit Turhan has said. The direct sales points were launched at the local municipality level as part of the government's effort to fight inflation and bring economic benefits to average citizens following a sharp increase in fruits and vegetable prices. Turhan said the project will be supported by the Agriculture and Forestry Ministry and Turkish Post and Telegraph Organization (PTT). It looks to avoid intermediaries in the distribution of agricultural products. Fruits and vegetables on www.epttavm.com will now be sold at prices set by the direct sales points and all products will be delivered safely to people via PTT Cargo and Logistics. The website, Turkey's national online marketplace, has assumed the responsibility so that people do not have to wait in queues and can buy vegetables and fruits on the cheap under favorable conditions. The Ministry of Transport and Infrastructure has been initiated joint efforts with the Ministry of Agriculture and Forestry in order to avoid charging people extra fees and increase the advantages of the practice. "We are working very hard so we can launch the e-tanzim application shortly," the minister said. A total of 600 tons of fruits and vegetables were sold on the first day of municipal direct sales in Istanbul and Ankara. The Istanbul Metropolitan Municipality announced that it transported 297.7 tons of vegetables to direct sales points on the first day, while the Ankara Metropolitan Municipality sold 348.5 tons of vegetables at its 15 direct sales points, amounting to a total of 646.2 tons in two of Turkey's largest cities. According to an Istanbul Metropolitan Municipality (İBB) statement, tomatoes were sold the most at 50 municipal direct sales points in 34 provinces, while green peppers were sold the least. A total of 118 tons of tomatoes, 70 tons of potatoes, 73 tons of onions, 16 tons of spinach, 15 tons of cucumbers, 2.7 tons of eggplants, 2 tons of banana peppers and 1 ton of green pepper were sold at affordable prices. The direct sales points sell tomatoes for TL 3, eggplants for TL 4.5, cucumbers for TL 4, banana peppers for TL 6, green peppers for TL 6, onions for TL 2, potatoes for TL 2 and spinach for TL 4. 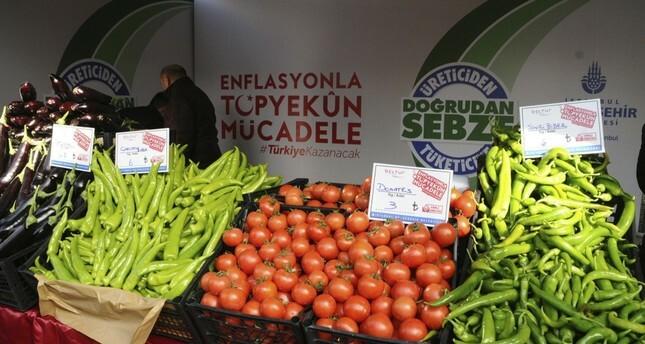 Sales points in Ankara sold zucchinis, in addition to tomatoes, potatoes, onions, peppers and eggplants. A total of 130 tons of tomatoes were sold on the first day of sales in Ankara, followed by 120 tons of potatoes, 60 tons of onions, 25 tons of cucumbers, 10 tons of peppers and 3.5 tons of eggplants. Citizens were quite satisfied with the prices. Onions and potatoes were sold at TL 2 a kilogram, cucumbers for TL 4, peppers for TL 6, eggplants for TL 4.5 and tomato and zucchinis for TL 3.